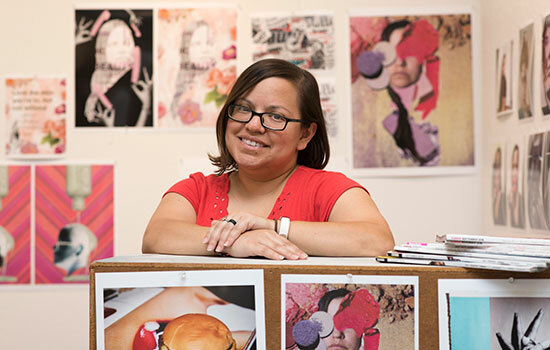 Mireya Salinas’s artwork focuses on using fashion magazines to bring attention to unrealistic standards of beauty. After serving in the U.S. Army for six years, including a yearlong deployment to Iraq, Mireya Salinas decided to pursue a career in photography. She had already earned a bachelor’s degree from Excelsior College while in the Army, completed a two-year program in photography at Austin Community College following her service, and was on the hunt for master’s programs in 2017. “I really wanted to go to a program that wasn’t just renowned but was going to be challenging and was going to push me, not just as a photographer, but as an artist,” said Salinas. After learning about RIT’s highly-ranked MFA in photography and related media program, she applied and soon got a call from Trevor Barrett, assistant director of RIT’s Veteran and Military Enrollment Services Office. The outreach assured her that although RIT was 1,600 miles away from her home in Copperas Cove, Texas, it would be the right fit. Today, Salinas, who moved to Rochester last year with her husband and two cats, is one of about 136 veterans studying at RIT. An additional 100 veteran family members, who are also eligible for military benefits, are pursuing degrees here. The university is annually recognized as a welcoming place for veterans by groups including U.S. News & World Report and Military Friendly. RIT partners with the U.S. Department of Veterans Affairs to administer the Yellow Ribbon program, providing qualified veterans and dependents 100 percent tuition coverage for undergraduate and graduate degree programs. And for more than 50 years, RIT has had a veterans services office dedicated to supporting and advocating for active-duty military, veterans and their dependents. Last year, RIT also launched Veterans Upward Bound (VUB), a TRiO program federally funded through a grant from the U.S. Department of Education. VUB helps veterans of all ages navigate the education system and gain entry in the program of their choice, which can be at any university, community college, certificate or trade program. The program has already helped 125 western New York veterans develop education paths. Tyler La Tray is the first student accepted to RIT after receiving help from the program. Before he started taking classes for a business administration degree at RIT this year, Director of Veterans Upward Bound Rachel Flaherty helped him get his benefits in line, gave him a tour of campus, showed him how to access his online course materials and more. La Tray grew up in Newark, N.Y., and has been actively serving in the U.S. Army Reserve for more than 10 years, including two tours in Iraq and one in Afghanistan as a heavy equipment operator. He currently works in real estate and sees an RIT education as a key step to launching a residential property management company. And while it’s been more than 10 years since he last took a class and completed his associate degree at Finger Lakes Community College, he thinks the military has prepared him well for this next step. 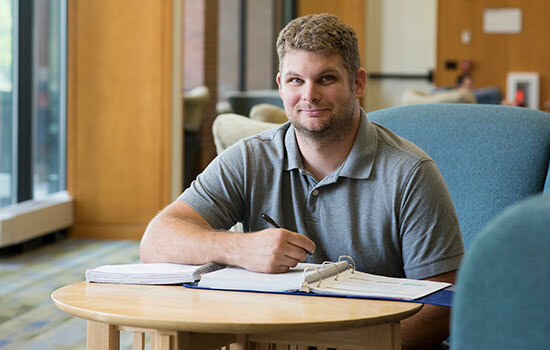 Other veteran students agreed that the disciplined approach they developed while serving in the military helps them with their current studies. When Brennan Jackson of East Rochester, N.Y., graduated high school in 2013, he didn’t feel ready for college. He said that although he breezed through his high school classes as an honor roll student and aced his SATs, he had no interest in continuing his education at the time. He instead enlisted in the U.S. Marine Corps and served for four years as an electrician with a tour in Europe and Morocco. Jackson said the experience was transformative and he emerged with a new maturity and work ethic, ready for the next step. He embraced his lifelong love of working with computers and started pursuing his degree in web and mobile computing in 2017. As a veteran, he found RIT appealing because it provides education with a purpose. 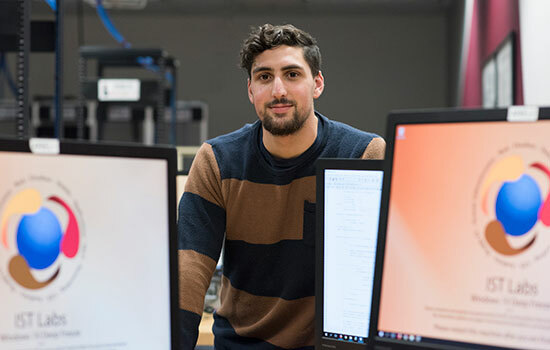 As Jackson works toward his degree, he’s making a concerted effort to connect with other veterans and to help grow the veteran culture at RIT. He and Salinas both got involved with the RIT Veterans Club last year. Today, Salinas serves as the organization’s president and Jackson is treasurer, and they have repositioned the organization as the RIT Veterans and Military Club, opening it to ROTC cadets, military families and veterans supporters as well to make it more inclusive. They are looking to expand networking opportunities and have long-term visions of a dedicated veterans lounge on campus. Salinas said it’s crucial for student veterans to have a support network of people with similar experiences. And she hopes more veterans will pursue degrees after their service, because they have the tools needed to succeed. Intersections: The RIT Podcast is a twice-monthly conversation between people whose daily work is making a difference in the world. This episode features Trevor Barrett, assistant director of RIT’s Veterans and Military Enrollment Services Office, and fellow former U.S. Marine and now RIT computing student Brennan Jackson talking about adjusting to life after military service and what RIT is doing—and still needs to do—to help veterans succeed in their educational pursuits.